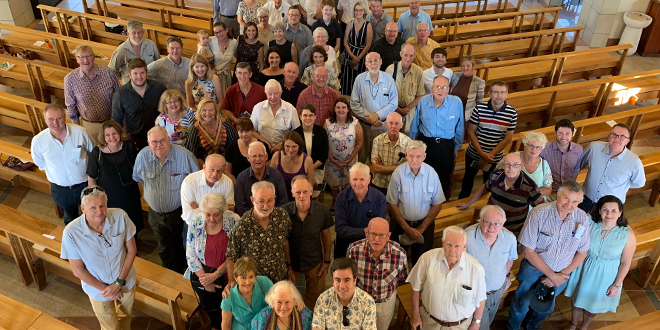 Fond memories: Those who lived and worked in East Timor gathering at St Joseph’s, Gregory Terrace for a final time to give thanks and to remember. SINCE 1999 the Christian Brothers have ministered to the “poorest of the poor” in East Timor but, due to an aging core of brothers, it was decided they should withdraw from the country and pass their ministry into new hands. A Mass celebrated at St Joseph’s Gregory Terrace last Saturday marked the end of their ministry, with brothers coming from around the country to mark its close. Christian Brother Damien Price said the brothers didn’t have the younger men who could go up into the hills of Dili and do the kind of work that was needed. “Most of our religious, the brothers are getting older, the sisters are getting older,” Br Price said. But even as the Christian Brothers withdraw, the Timorese remain in safe hands. The Christian Brothers settled on a Josephite organisation called Mary MacKillop Today to take over their ministries. “They’ve been in Timor for many years and they’ve got a lot of Timorese people working with them,” Br Price said. “About two years ago, we approached them and said look, as we (the Christian Brothers) go, could we transition our ministry over to you so the poor people weren’t going to be left without any support. The association with East Timor began in 1999 when the region was suffering from internal and external struggles. This led Br Dan Courtney, an old boy of Gregory Terrace, to volunteer to go there. He uncovered a crucial piece of information – most of the religious orders rarely left the city of Dili. Br Courtney and an Irish brother travelled into the hills behind Dili, offering all they could to the impoverished people there. There were many stories of Br Courtney putting his life on the line for the people and he is an honoured figure throughout the area. Tragically, he was involved in a motorbike accident in 2001, putting him in a coma for 11 years until his death in 2012. With all they had done, Br Price said the Christian Brothers were “very anxious” about leaving. “You build a relationship with the people; we didn’t just want to be turning out the lights,” he said. But that was a far cry from the brothers’ legacy in East Timor. One of the Christian Brothers’ major projects was building kindergartens to improve the educational outcomes for the Timorese, many of whom lived in subsistence farming communities. Br Price said the best thing to do was to start kindergartens, which were called tekas by the Timorese. “We said, in every little village let’s get a teka going,” he said. “If we can train the people to run the local preschools, that’s a really good start. “As we’re leaving, we’re handing over nine really wonderful kindergartens. Br Frank Hennessy, a Victorian Christian Brother, oversaw the teka system. Br Hennessy was the ministry leader in Timor Leste for the past five years before the ministry ended and was in town for the Mass at Gregory Terrace. He said ministering to the poor in East Timor was tough, often unrewarding, but necessary work. “One of the big things that came out, particularly Timor, is that we lived in the village,” he said. Br Hennessy said a shared faith united the people, even with stark cultural differences. One of the supporting partners over the years has been the Terrace Timor Network. “That’s a group of mothers and fathers associated with St Joseph’s College, Gregory Terrace,” Br Price said. The network, formed in 2006, provides aid to the area through fundraising initiatives.